Protests broke out in major Romanian cities after numerous problems stopped thousands of Romanians living abroad from voting in the first round of the presidential elections, EURACTIV Romania reports. 25 years after the fall of the Berlin wall, another type of barrier is being brought down in Romania. After countless irregularities and problems prevented expatriate Romanian citizens from casting their vote in the first round of the presidential elections, protests broke out across the country demanding the authorities dismantle the blockade imposed on electoral rights. Romanians living in the country rallied to support their fellow citizens living abroad. They called on the government to guarantee a fair second round, and to facilitate a common sense procedure that will allow everyone to cast their vote. The first protest was organised on 2 November, just before the end of the first electoral round. Information coming from social media made it clear that citizens living abroad were stuck in endless lines waiting to vote. In the evening, a small protest was organised in front of the Romanian Ministry of Foreign Affairs, where most participants demanded the resignation of Foreign Affairs Minister Titus Corl? ?ean, and of Prime Minister Victor Ponta. Ponta has since declared in a press conference that his foreign affairs minister will be fully accountable for any problems that might interfere with the following voting round. This statement did little, if anything, to calm Romanian public opinion. Officials close to the social-democrat government attempted to put the blame on the Central Electoral Authority and the representatives of the political parties that should have been present at the voting stations. Irrespective of these attempts, no official report covering the allegations was released. The explanation offered to the public was that the slow processing procedure at voting stations abroad was put in place in order to ensure full compliance with the law and to avoid any suspicion of fraud. That answer left many with questions about the capacity and will of the government to improve the voting process abroad. 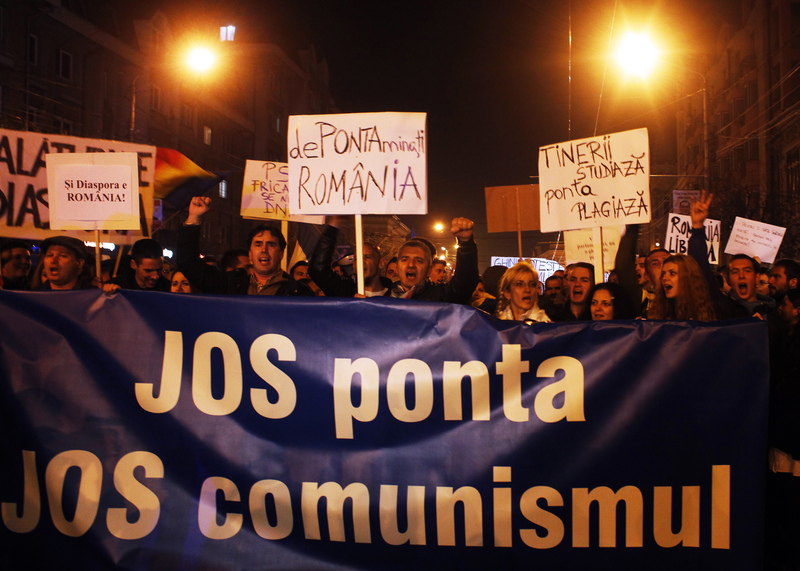 Considering that the majority of the foreign votes are expected to go in the second round towards Klaus Iohannis, the presidential candidate of the right, all the elements were in place for new protests to be organised against the social-democrat presidential candidate, Victor Ponta. The current government has promised a smooth second round and has increased staff numbers at foreign voting stations but public concern remains high. Protests broke out across the country and in some of the foreign cities where large numbers of citizens were unable to vote. Thousands of Romanians have protested in Cluj, Timi?oara, Ia?i, Constan?a, Sibiu and Bucharest, while hundreds have made their voices heard in London, Dublin and Paris. Many of the protests were directed against the current government, calling for Ponta’s resignation. On the other hand, there have also been groups that support him. Social media has been influential in mobilising protestors, most of whom are young people. The final presidential runoff between Ponta and Iohannis is continuing in the same slow-paced rhythm of before the first round. The only difference is that the complete lack of debates has been replaced with a continuous quarrel over the location of an eventual presidential debate. Currently the campaign teams of both candidates are negotiating the terms and location of the presidential debate, but it is uncertain where and if this meeting will take place. At the same time, the electoral arguments of the candidates have become connected with expatriates’ voting problems. Ponta’s failure to secure adequate voting procedures contrasts sharply with a campaign built on the efficacy of his government. Iohannis is faced with the problem of rallying enough support to win the election. A few hours after the publication of this article the Romanian Minister of Foreign Affairs Titus Corl? ?ean resigned, stating that he cannot allow the Ministry to break the law and create new voting stations abroad. Corl? ?ean said at a press conference that the illegal creation of additional voting stations abroad would constitute grounds for contesting the results of the second round. He also blamed for the development the outgoing president Traian B?sescu (EPP-affiliated) and of the right-wing presidential candidate, Klaus Iohannis. It is assumed that most of the votes that come of abroad favour the centre-right candidates. According to Romania's Central Electoral Office, incumbant Victor Ponta obtained 40.44% of the number of valid votes and Iohannis, his opponent, 30.37%. But despite this lead, nothing is certain for the second round. An important element that stands to influence the second round is represented by the actions of the former candidates. Combined, all the other 12 candidates have gained almost 30% of the votes, half of which were cast for the first three, including C?lin Popescu T?riceanu (independent, a former liberal Prime Minister), Elena Udrea (PMP, a former Liberal Democrat Minister of Development) and Monica Macovei (independent, currently a member of the European Parliament). Commentators suggest that C?lin Popescu T?riceanu might be appointed as Prime Minister, in return for his support for Ponta.